Economical and efficient - adult disposable washcloths clean and moisturize your skin. Compose is a no-rinse product; wash and moisturize your skin in one action. Eliminates rinsing after washing, and applying lotion after drying. Clean yourself and apply Aloe and Lanolin to your skin at the same time. 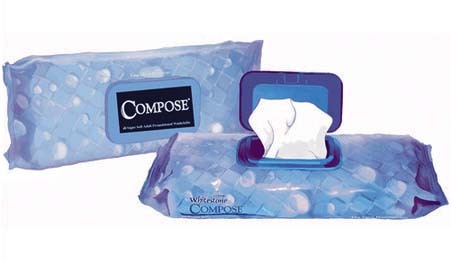 Compose disposable washcloths are "Extra Soft Splunlace" and gentle, even on delicate tissue areas. At the same time they are strong and puncture resistant. 9" x 13" - not baby wipes! Available in "soft pack" dispensers of 48 washcloths. The soft pack makes it easy to pack into your suitcase to take with you without a lot of wasted space.